COLUMBIA, Mo. 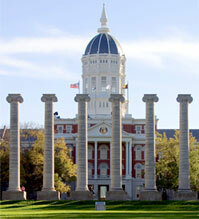 — Political experts at the University of Missouri are available to assist reporters on several issues relevant to the 2012 elections. Best’s research focuses on elections and politics in advanced democracies, especially Europe. She studies the rise and influence of new political groups, such as environmentalists and radical-right populists. The interplay between political figures and the media is Horner’s area of expertise. He can discuss how political humor affects public perceptions of politicians and thereby influences their careers. Horner also studies how media coverage influenced legislation on segregation and gun control. Horner wrote books on all of these topics, including Ohio’s Kingmaker: Mark Hanna, Man and Myth. McKinney has served as a staff member in the U.S. Senate and the White House and as a consultant to C-SPAN and the U.S. Commission on Presidential Debates. His academic expertise is in political communications, especially presidential debates, and the intersection of media & politics. Mitchell’s interdisciplinary study of criminal law incorporates his academic training as a sociologist and legal scholar. His research focus is on issues related to felon disenfranchisement and reentry, including their voting rights. Minta focuses on the representation of African-American and Latino interests in the national legislature and how minority members have influenced Congress. Minority politics, especially related to blacks and homosexuals, is one of Overby’s areas of expertise. He has expertise in campaign advertising, especially radio advertisements. He is knowledgeable on issues relating to Congress, such as the public’s opinion of congressional leaders and state legislatures. Petrocik’s research examines the influence of social forces and group decision-making on politics as well as how social divisions drive elections. He has studied the ability of candidates to set the agenda of political discourse and co-authored Unconventional Wisdom: Facts and Myths About American Voters. Reuben’s areas of expertise include the legal issues surrounding elections such as campaign finance, voting rights, and contested elections. Squire’s research has observed how Congress and other legislative bodies have changed over time. His knowledge extends to the intersection between political careers and governmental institutions.